This is the least severe form of nerve injury, with complete recovery. In this case, the actual structure of the nerve remains intact, but there is an interruption in conduction of the impulse down the nerve fiber. Most commonly, this involves compression of the nerve or disruption to the blood supply (ischemia). There is a temporary loss of function which is reversible within hours to months of the injury (the average is 6–9 weeks). Wallerian degeneration does not occur, so recovery does not involve actual regeneration. There is frequently greater involvement of motor than sensory function with autonomic function being retained. In electrodiagnostic testing with nerve conduction studies, there is a normal compound motor action potential amplitude distal to the lesion at day 10, and this indicates a diagnosis of mild neuropraxia instead of axonotmesis or neurotmesis. This is a more severe nerve injury with disruption of the neuronal axon, but with maintenance of the myelin sheath. [clarification needed] This type of nerve damage may cause paralysis of the motor, sensory, and autonomic. Mainly seen in crush injury. Axonotmesis involves loss of the relative continuity of the axon and its covering of myelin,[clarification needed] but preservation of the connective tissue framework of the nerve ( the encapsulating tissue, the epineurium and perineurium, are preserved ). Because axonal continuity is lost, Wallerian degeneration occurs. Electromyography ( EMG ) performed 2 to 4 weeks later shows fibrillations and denervation potentials in musculature distal to the injury site. Loss in both motor and sensory spines is more complete with axonotmesis than with neurapraxia, and recovery occurs only through regenerations of the axons, a process requiring time. Physiological mechanisms or neuroregeneration may include remyelination, generation of new neurons, glia, axons, myelin orsynapses. Neuroregeneration differs between the Peripheral Nervous System (PNS) and the Central Nervous System (CNS) by the functional mechanisms and especially, the extent and speed. To fix a cut nerve, the insulation around both ends of the nerve is sewn together. A nerve in a finger is only as thick as a piece of thin spaghetti, so the stitches have to be very tiny and thin. The repair may need to be protected with a splint for the first 3 weeks to protect it from stretching apart since it is so delicate. The goal in fixing the nerve is to repair the outer cover so that nerve fibers can grow down the empty tubes to the muscles and sensory receptors and work again (seeFigure 2). The surgeon tries to line up the ends of the nerve repair so that the fibers and empty tubes match up with each other as best as possible, but with millions of fibers in the nerve, not all of the original connections are likely to be re-established. If a wound is dirty or crushed, your physician may wait to fix the nerve until the skin has healed. If there is a gap between the ends of the nerve, the doctor may need to take a piece of nerve (nerve graft) from another part of the body to fix the injured nerve. This may cause permanent loss of feeling in the area where the nerve graft was taken. Smaller gaps can sometimes be bridged with “conduits” made from a vein or special cylinder. Nerve repair with realignment of bundles.The insulation around both ends of the injured nerve is sewn together. The goal in fixing the nerve is to save the insulating cover so that new fibers can grow and the nerve can work again. Once the insulating covering of the nerve is repaired, the nerve generally begins to heal three or four weeks after the injury. Nerves usually grow one inch every month, depending on the patient's age and other factors. With an injury to a nerve in the arm above the fingertips, it may take up to a year before feeling returns to the fingertips. The feeling of pins and needles in the fingertips is common during the recovery process. While this can be uncomfortable, it usually passes and is a sign of recovery. With a nerve injury, the brain may need to be "re-educated." After the nerve has recovered, sensory re-education may be needed to improve feeling to the hand or finger. This involves physician therapy and the appropriate therapy based on the nature of the injury will be recommended by the physician. "The nerve is made up of many thousands of fibres like you can see in a telephone cable. "These need to be reconnected for the telephone to ring." Dr Gary Coulton, of St George's Hospital Medical School in London is one of the leading experts treating nerve damage, suffered by thousands of people each year. The causes can range from household accidents to stabbing, or casualties in war - and are notoriously difficult to treat and slow to heal. Now Dr Coulton and his colleagues have discovered key proteins which are essential for nerve regeneration. BBC News Online investigates how scientists plan to "bridge the gap". Nerve damage can cause long-term problems. The exact nature of the damage depends on where the affected nerves are, but injuries tend to heal very poorly and cause extensive disability, often wrecking patients' lives. And the longer patients wait for their injury to be treated, the smaller the possibility of successful treatment. At the moment, nerve damage is repaired either by sewing the nerve ends back together or by a graft of a nerve from the lower leg, which causes more damage, prolonging the recovery time. But scientists at the Royal Free and St George's Hospitals in London are hoping key scientific discoveries will improve patients' chances. Special proteins have been identified which encourage growth, speeding up the repair process. Two have been identified - NGF and NT-3. NGF increases the number of nerve fibres reaching the skin, which improves the sensitivity of skin. NT-3 seems to act on the nerve cells responsible for fast contracting muscles. The researchers say this means there must be another growth factor responsible for slow contracting, weight-bearing muscles, which are responsible for posture. Action Research says more information about how specific nerve cells work will help surgeons repairing nerves. A member of the research team, Dr Giorgio Terenghi, head of the Nerve Regeneration Group at the Blond McIndoe Centre, Royal Free and University College Medical School, added: "It could be useful for any patient who is undergoing nerve repair. "Although this new therapy will be applicable only to recent nerve injury, we cannot exclude that development in this field might eventually lead to the treatment of patients who have suffered nerve injury in the past." 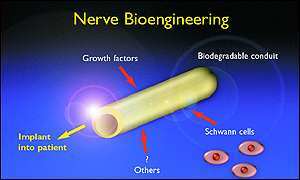 Scientists had already developed "bridges" - very small tubes that can link healthy and damaged nerves - which can be filled with the growth factor proteins. The team have also carried out further work into the use of special genetically modified cells called Schwann cells. These wrap around nerve fibres, helping one cell communicate with another via electrical impulses. Schwann cells can be injected into the "bridges", producing extra amounts of growth factors. Because they can be labelled and identified, they can be tracked once they are transplanted. Dr Coulton added: "Identification of all these different factors contributing to nerve regeneration will be a crucial step forward."